In 1967, when I arrived in Milan, I started working as a designer, even if I was an engineer, at the studio Ponti, Fornaroli, Rosselli. I was discovering the world of industrial design with an unusual approach, reaching the concepts following my interests. At this moment my attention was concentrate on the possibility to use existing industrial components to create new objects. 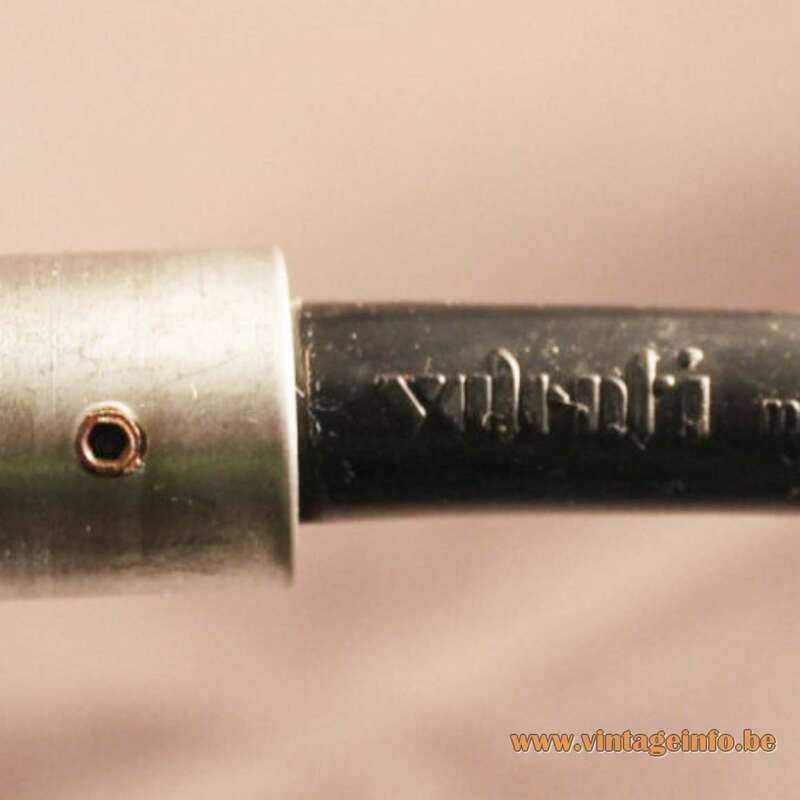 In a store near the Columns of Saint Lorenzo, in Milan, I found a simple flexible tube that cost 20 lire per meter, so with a total expense of 1000 lire (half Euro), you could buy 50 meters of wrinkled electrical tube. With this “precious” material I went to Valenti, the company that I was suppose to collaborate with. I spent, together with the workers, the whole afternoon in the workshop of the company, cause I wanted to create a lamp from this tube. We manage to find and assemble all the necessary pieces, except the base. It was a problem that we couldn’t resolve. While we were talking, playing with this object, we understood. 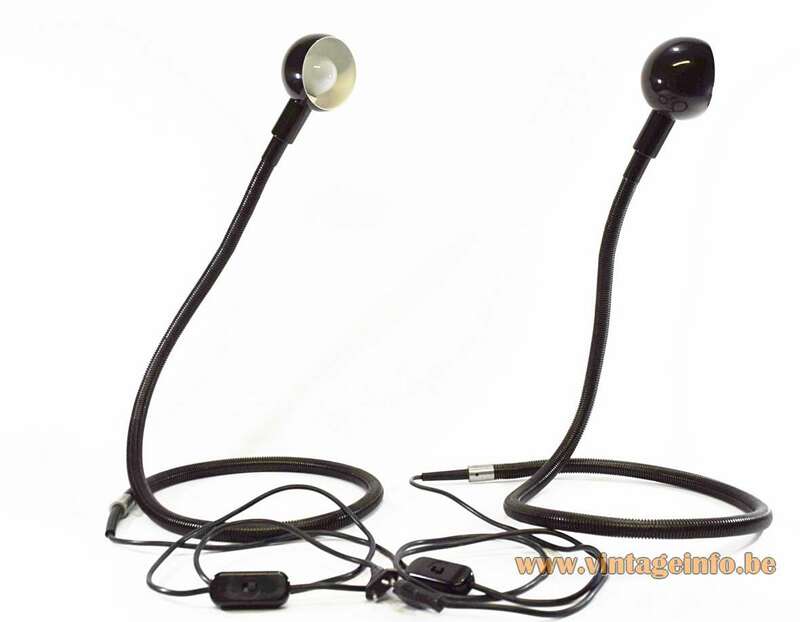 If we roll up the flexible tube, the lamp can support by itself, without any kind of base. In this way Hebi was born, and put in the production from 1970. Produced by Valenti, Hebi had an immediate success, selling 5000 pieces in one month. Hebi is a product that wasn’t designed, but had an immediate power of communication. It’s concept was the movement: the flexible tube folds, make soft curves and after a sensual dance finish illuminating with a small spherical diffuser. The key point of the Hebi project is the “lack”, that here has a positive meaning. The lack of the base has simplified the project and has introduced you the creative component, that is a patrimony for everyone, everyone that interacts with this object. A Valenti Hebi table lamp was used as a prop in the French film Les Garçons et Guillaume, à Table! from 2013. (Me, Myself and Mum) An autobiographical comedy written, directed by and starring Guillaume Gallienne. You can view the complete movie with much more other lamps over here! A Valenti Hebi table lamp was used as a prop in the French drama film Le Premier Jour du Reste de Ta Vie from 2008 (The First Day of the Rest of Your Life). Starring Jacques Gamblin, Zabou Breitman, Déborah François. Directed by Rémi Bezançon. Text and photo of Isao Hosoe used with kind permission of Takeo Hosoe, his son; all Isao Hosoe and Isao Hosoe Design photos, drawings and texts are reserved. Materials: Dark brown, almost black PVC. Metal goose-neck. Aluminium lampshade, white painted inside. Bakelite socket. Not any type of light bulb can be used, A small round bulb is required. Designer: Isao Hosoe in 1969, in production since 1970. Manufacturer: Valenti, Milan, Italy, today SP Light, Buccinasco, Italy. 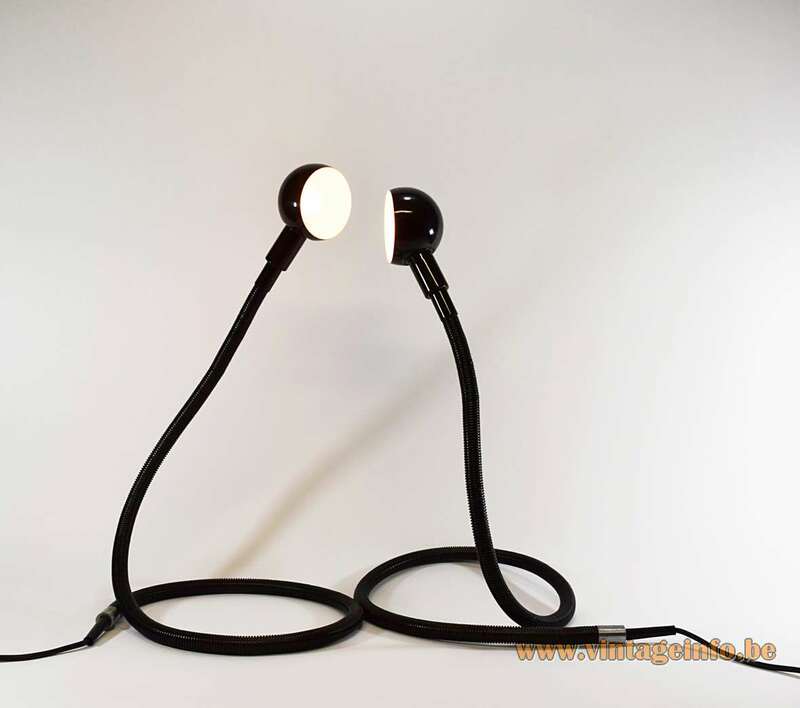 Other versions: Also made as a clamp lamp and made in many colours. A table lamp, the Hebi Tavolo was also made, you can find it over here. Hebi is the Japanese word for snake. The flexible metal tube is covered in plastic and can be twisted in every direction and the lamp shade can be rotated as well. 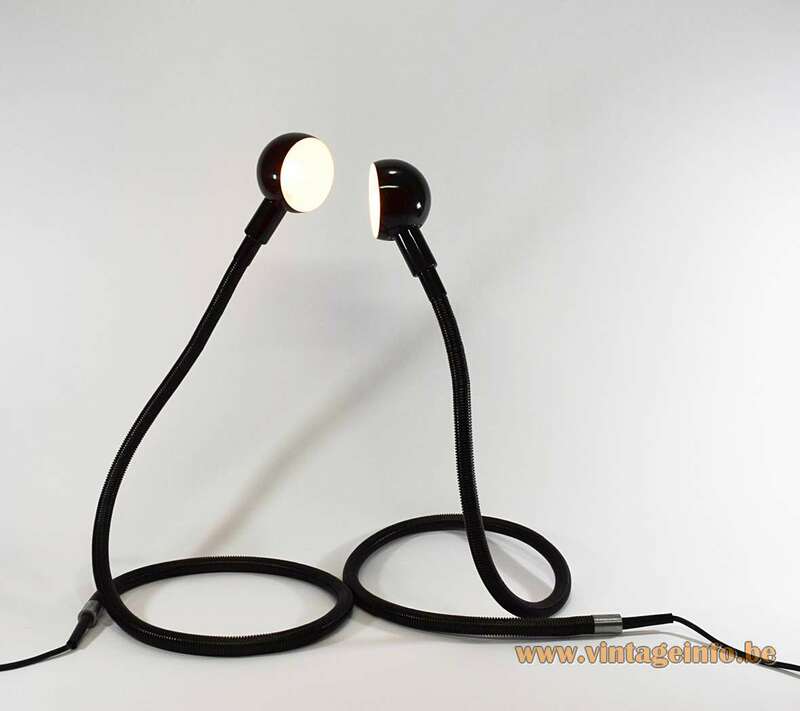 A lamp with an unlimited flexibility of positions. 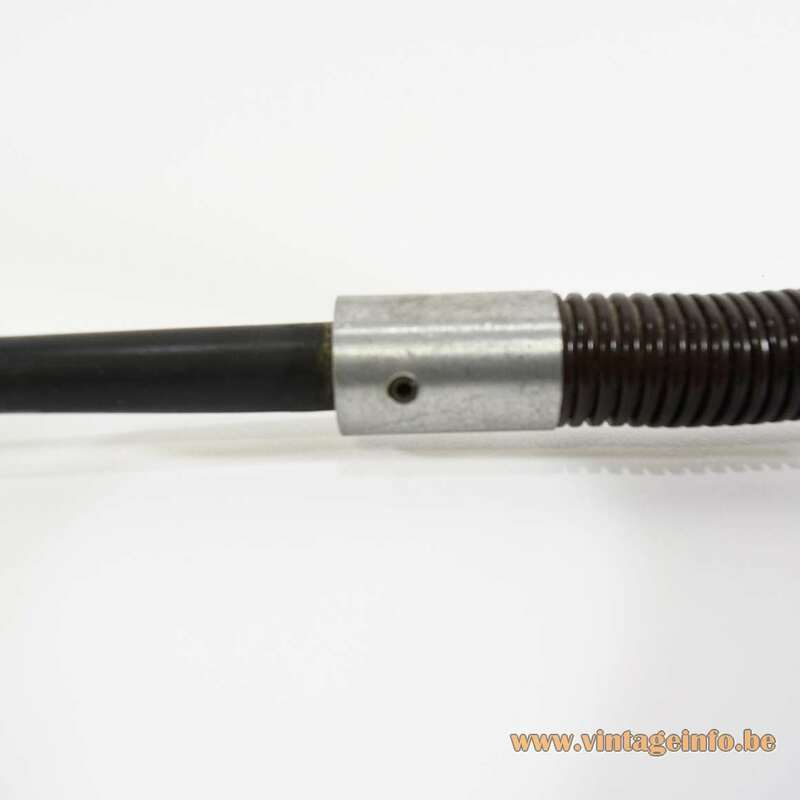 It uses almost exclusively already existing components such as the PVC tube, usually used in wall cavities to carry electrical cables. Versions and colours changed during the years. 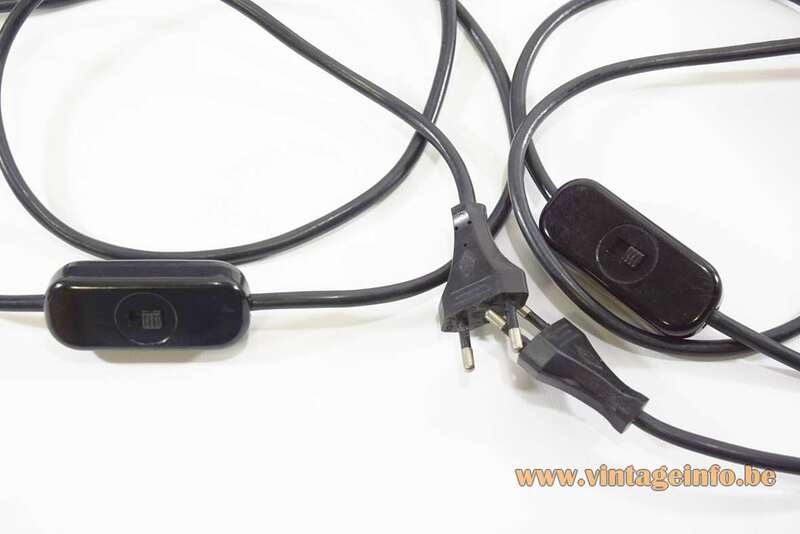 The first editions have a big VLM-switch model 475 designed by Achille Castiglioni and a aluminium tube with a internal hexagon socket-head screw on the end. Where the wiring starts is in later versions “Valenti Made in Italy” moulded in the rubber. More recently produced models were cheaper made and didn’t have the aluminium end tube; it became a plastic one. 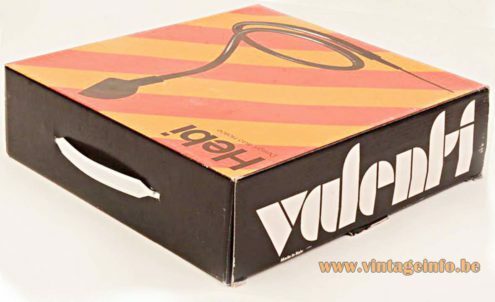 The name Valenti appeared in the middle on the flex tube. 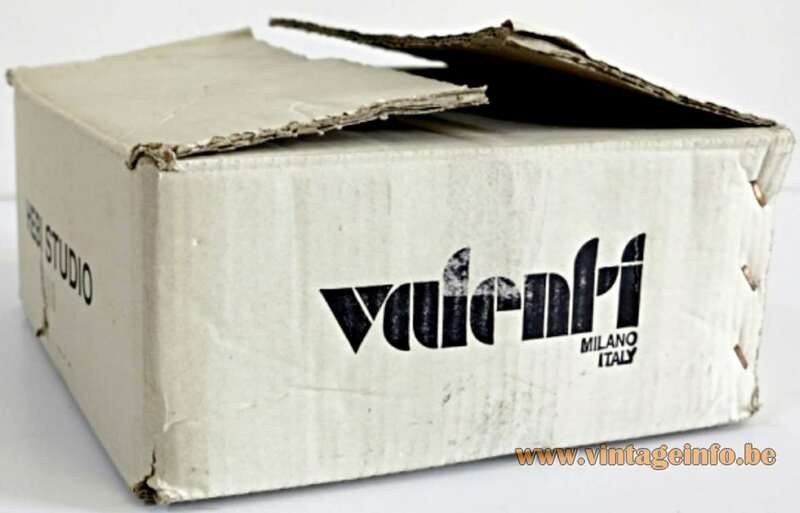 Valenti was founded in Milan in 1929 as a metalworking company. It became one of the most important companies of the Italian design movement under the leadership of the brothers Diego and Renzo Phigi. 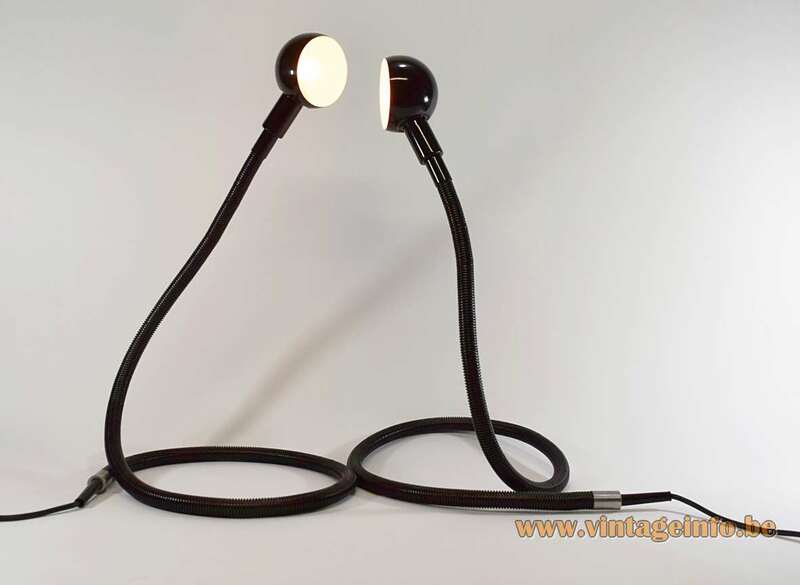 Famous lighting produced by Valenti: Medusa floor and table lamp, design Olaf Von Bohr in 1968. The Pistillo flush mount/wall lamp, design Studio Tetrarch in 1969. The Medusa lamp was also sold under the Ecolight label. Ecolight is the successor of the Valenti company. Ecolight was born in 1968. However, the name Valenti was used until the 1990s. 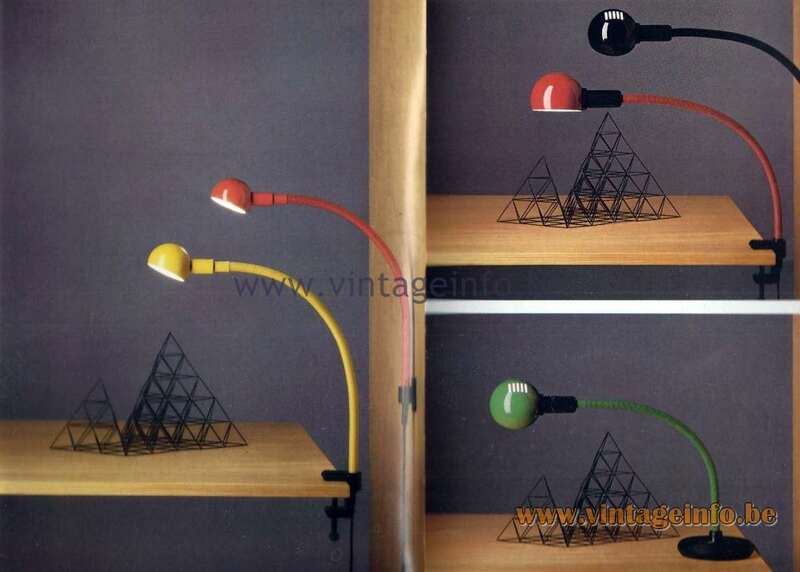 Many lamps were sold as Valenti and also as Ecolight. This Pillola lamp was sold under both names. Ditto for the Squadra wall lamp. The business was run by Carla and Laura, the daughters of Renzo. In 2013, SP light and Design was born from the desire of Carla and her husband Luciano to pursue the family business, joined by their eldest daughter, Eleonora. 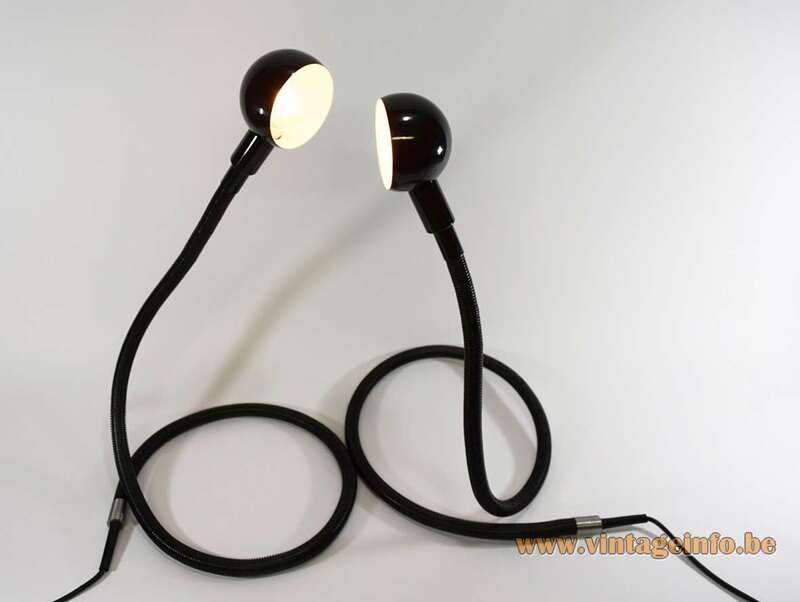 SP light and Design still sells some of their design icons such as the Pistillo and Pistillino wall lamps and the Medusa floor lamp. Today (2017) the Hebi lamp is still in production. Available in red, black, white. You can find it on their website. On permanent display at the Brooklyn Museum in New York at the 20th Century Gallery, Victoria and Albert Museum, London, the Centre Georges Pompidou in Paris and at the Triennale di Milano. Bachelor of Science (1965) and Master of Science (1967) in Aerospace Engineering from the Nihon University of Tokyo (with the project “The Man Powered Aircraft”). He has been living in Milan since 1967. He collaborated with Architect Alberto Rosselli of the Studio Ponti-Fornaroli-Rosselli P.F.R. from 1967 to 1974 (Gio Ponti & Antonio Fornaroli). In 1985 he founded his own studio Isao Hosoe Design. Member of A.D.I. (Italian Association of Industrial Designers), S.I.E. (Italian Society of Ergonomics), the Japan Design Committee and the Japan Inter-Design Forum. He has been a lecturer at the Scuola Politecnica di Design of Milan, at the Istituto Europeo di Design of Cagliari, at the Stoa of Naples, at the Domus Academy of Milan and at the I.S.I.A. of Florence. Until his dead he was professor of Industrial Design at the Politecnico of Milan, at the University of Siena and at the University of Rome La Sapienza. Isao Hosoe has had five personal exhibitions: in 1983 at the Design Gallery, Matsuya Tokyo; pin 1987 at the Design Concern Gallery, Seattle; in 1988 at the Itoki Gallery,Tokyo; in 1990 at the Seibu Creator’s Gallery, Tokyo and in 1990 at the Design Gallery, Matsuya Tokyo. He has also participated in numerous collective exhibitions in Italy and abroad. In April 1990 at the Triennale of Milan he organized the exhibition “Work Encounters: Domesticity in the Office” with the Domus Academy. Co-author of the book “PLAYOFFICE”, published in 1991 by the G.C. Press of Tokyo. Among his clients: Arflex, Belli e Forti, Bernini, Bif Korea, Bisazza, Bosch Telecom/Telenorma, Bruno Magli, Cassina, Cazzaro, Ceccato S.p.A., Du Pont, Elsag/Bailey, Fiat, Fujitsu, Honda Motors, Itoki, Iveco, Japan Rail West, Kale, Kartell, Leonardo, Luxoit, Mazda, Mitsubishi Motors, Montedipe, Philips, Piaggio, Playline, Sacea, Gruppo Sacmi, Segis, Serafino Zani, S.N.C.F. Ferrovia Francese, Status, Steelcase Strafor, Tonelli, Toshiba, Uchida Yoko, Valenti, Zanussi. Compasso D’ Oro Award: winner in 1970 with the “Meteor” Gran Tourism Bus (Carrozzeria Orlandi), in 1979 with the “Spazio” coach (Iveco Carrozzeria Orlandi), and in 1998 with “FMP 270 Pulsar”, kiln for ceramic tiles (Sacmi Forni); products selected in 1981 “Flapping” transport seat (Lazzerini S.p.A.), in 1987 with “Modulus” robot (Sirius); “Snake” flexible wall (Sacea); in 1998 the “T-1 Telephone System (Bosch/Telenorma) received an honourable mention during the Compasso d’oro Award, in 1989 with “Space” Floppy Disk Container (Mass Plast); winner in 2005 with “Onda” (LuxIt). SMAU Award: winner in 1976 with the “Saceasit ” office chair system (Sacea), in 1980 with “Saceasoft Direzionale” and “Saceasit Direzionale” office system furniture (Sacea) and in 1995 with “T-1 Office Telephone” (Bosch/Telenorma). Products selected: in 1984 “Buic 1500” Microfilm Machine (Buic), in 1986 “Slam” page reader system (Elsag), in 1987 “Space” office wall system (Sacea) and “Space” Floppy Disk Container (Mass Plast). Other awards include: A Gold Medal at the Biennale of Industrial Design at Lubiana in 1973 “Hebi” lamp (Valenti), a Gold Medal at the 15th Triennale of Milan in 1973 (Japanese Pavillion). 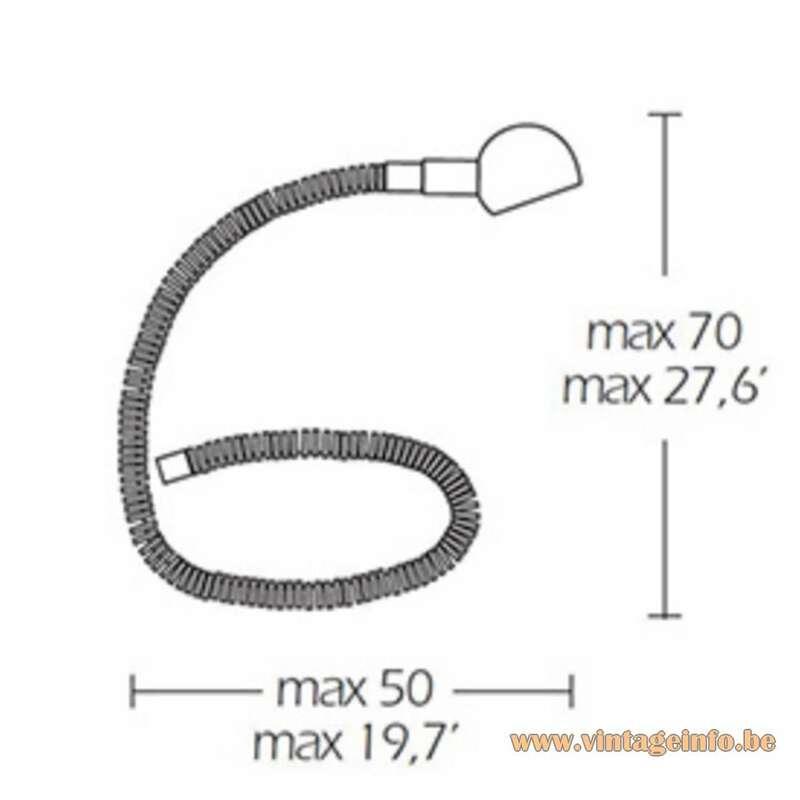 Products selected for the Office Design Orgatechnik in 1988 “Space” and “Snake” office wall systems (Sacea). Products selected for the Forum Design in 1988 Glass Furniture (Tonelli). Winner of the Good Design Award from the Japanese Ministry of Commerce and Industry in 1988 with “Bio-Table” office tables (Itoki), Design Innovationen 1994 at the Design Zentrum Nordrhein Westfalen with the “Oasy” Office System (Sacea). Design Innovationen 1995 at the Design Zentrum Nordrhein Westfalen with “Mach” expresso maker (Serafino Zani), I.D. Annual Design Review ’95 with “Dune” Theater seating (Arflex) and “Heron” office lamp (Luxo Italiana), ‘96 with “Mach” expresso maker (Serafino Zani), at The Chicago Athenaeum winner of the Good Design Award ’95 with “T-1 Telephone System (Bosch/Telenorma). ‘96 Good Design Award with “Heron” office lamp (Luxo Italiana), Good Design Award ’99 with “Tableware” (Belli e Forti), “HOI” office lamp (Luxo Italiana), “Please” Stacking Armchair (Segis S.p.A.) and 2000 with “Onda”(Luxo Italiana), system for office lighting. In 2002 “Onda” (Luxo Italiana), system for office lighting is the winner of the European Design Competition during Frankfurt Light + Building; and in the same year “Hebi”(Valenti) and “Heron” (Luxo Italiana) enter the Permanent Collection at the Animal House Exhibition, Triennale Milan. In 2005 “CAM-ST” with Palazzoli is the winner of Good Design Chicago. 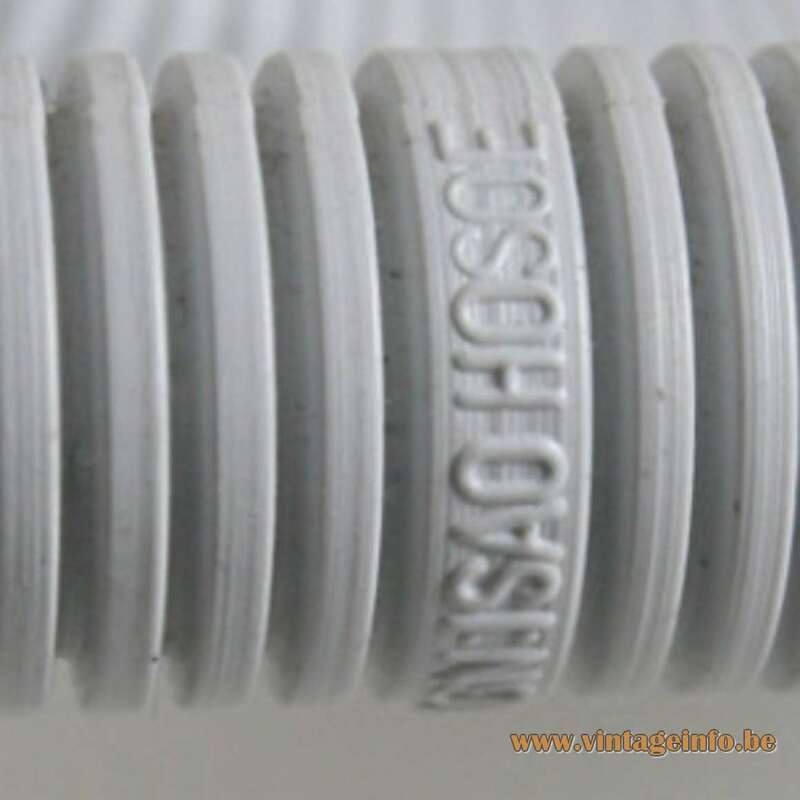 Brushed aluminium tube with a internal hexagon socket-head screw. 1st edition and later version. On the left below: Hebi Scheme. On the right below: Marking on the later versions, somewhere in the middle of the plastic tube. Red Valenti Hebi lamp. Spotted at Undesignable. 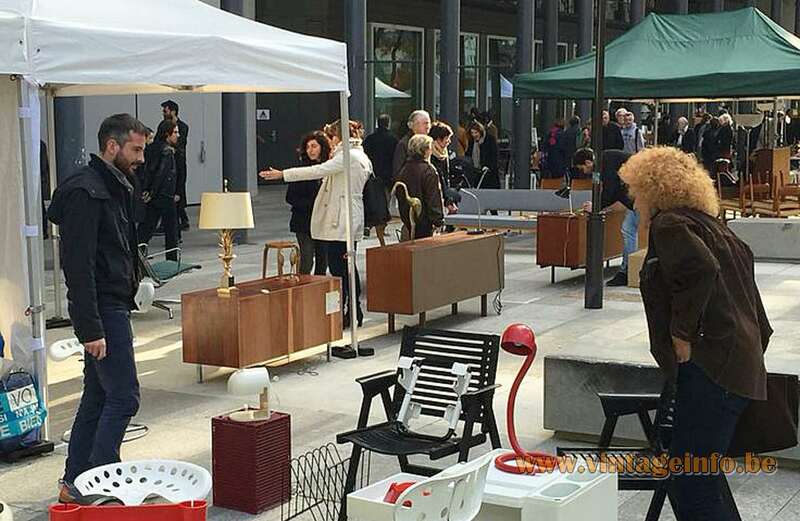 A vintage design fair which takes place twice a year in the Rue des Fossés Saint Bernard, 75005 Paris, France. More info over here.